For just $12, the Super Lunch Special Combo at Restaurant Joy in The Somerset Street Village will fill you up well and fully and make you happy. The deal starts with miso soup, light and restorative enough. Then comes the tough choice of two items from List A or two from List B. ‘A’ offers eight options (the likes of Boston rolls, crunch rolls, and various tempura assemblies) while ‘B’ presents vegetarian options for rolls, plus things like udon noodles and fried gyoza. The (very) small print reminds you that choosing from List A will cost you a buck more than a choice from B, and this turns out to be the only annoying thing about Joy. (Especially for a girl who finds herself joylessly without her reading glasses.) No matter. Even for $12.99 it seemed a bargain because my order — miso soup, a crunchy iceberg lettuce salad livened with a ginger dressing, a puck of well cooked rice, four fat shrimp tempura, a couple of onion tempura, and eight pieces of spicy salmon maki – was tasty and wildly generous. 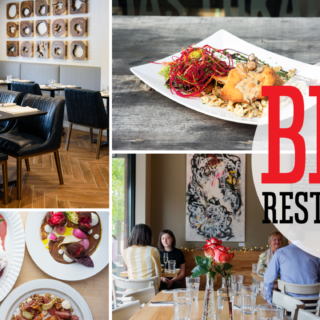 There are lunch deals at Joy beyond The Super Special. 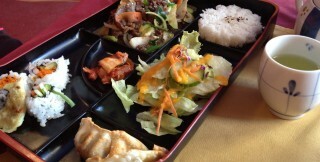 My buddy had a bento box. 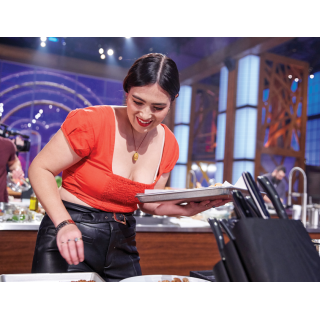 Hers was filled in with crisp gyoza, three California rolls, a mound of the house kimchi, a gingered salad and a flavourful bulgogi – a stir-fry of marinated beef and perky vegetables redolent of soy and sesame. These are not complicated lunches and they will not rock your world, but Joy is lively, fun, quick and the price to portion ratio will make you happy. 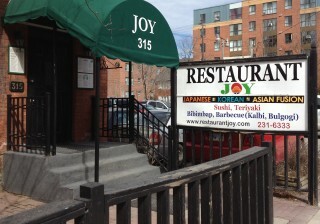 Restaurant Joy, 315 Somerset St. W., 613-231-6333.